Anna Bolton | Greene County News Commissioners Bob Glaser and Alan Anderson, Family Visitation Center staff member Nick, Center Coordinator Libby Powers, staff members Megan, Julie, Ceci and Laurette and Commissioner Tom Koogler recognize supervised visitation awareness month at an April 19 meeting. Submitted photo Staff members Laurette, Megan and Center Coordinator Libby Powers honor Volunteer of the Year Tarah Mongold (center right) for her service. 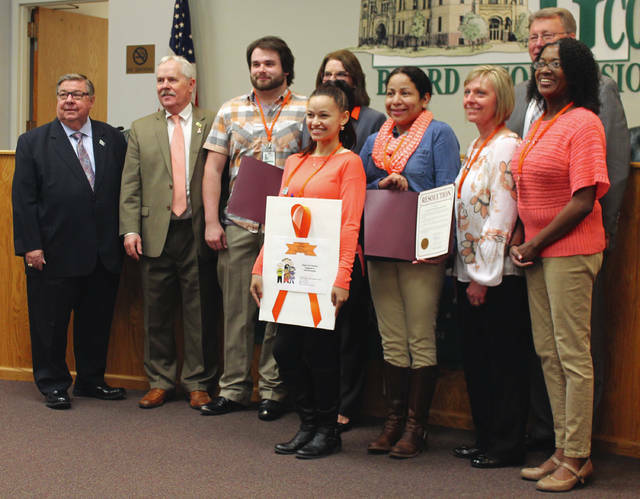 XENIA — The Greene County Family Visitation Center has been celebrating Supervised Visitation Awareness Month this May with orange ribbons. Greene County commissioners recently recognized the center for their service, passing a resolution for the month and honoring a volunteer of the year. Located at 143 East Market Street, the organization provides supervised visits and other services in a structured and safe environment. Powers said in 2017, 258 children were referred to the center for supervised contact with a parent. Direct service hours increased 50 percent from the previous year. The Victims of Crime Act (VOCA) grant allowed for an increase in staff, the addition of safety personnel in the building during most direct service hours, and more training. The center named Tarah Mongold as Volunteer of the Year. “She is phenomenal. She’s assertive; she’s built great rapport with our clients while keeping professional boundaries,” staff member Megan said. Mongold will begin her graduate studies in social work. In 2017, 36 volunteers and student interns contributed 3,637 hours to the center. https://www.fairborndailyherald.com/wp-content/uploads/sites/50/2018/05/web1_OrangeRibbon.jpgAnna Bolton | Greene County News Commissioners Bob Glaser and Alan Anderson, Family Visitation Center staff member Nick, Center Coordinator Libby Powers, staff members Megan, Julie, Ceci and Laurette and Commissioner Tom Koogler recognize supervised visitation awareness month at an April 19 meeting. 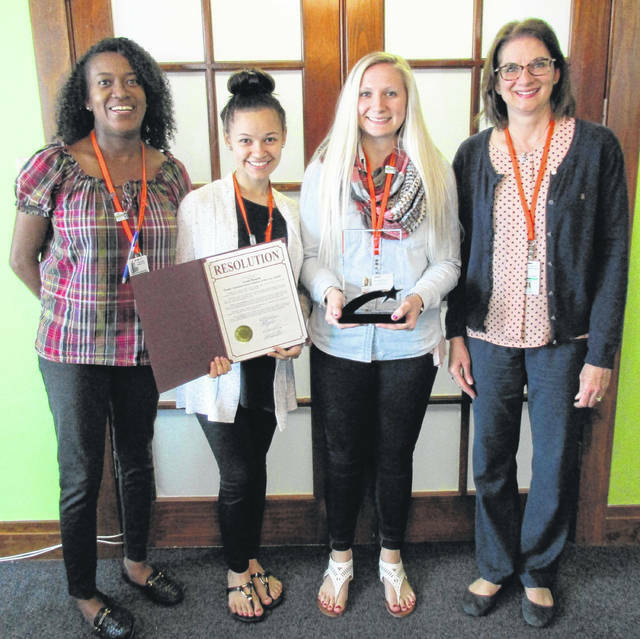 https://www.fairborndailyherald.com/wp-content/uploads/sites/50/2018/05/web1_Volunteers.jpgSubmitted photo Staff members Laurette, Megan and Center Coordinator Libby Powers honor Volunteer of the Year Tarah Mongold (center right) for her service.